A form of seaweed that has been dried to be used as a thickener in food. Traditionally used in Asia, it can be substituted for gelatin. It actually sets stronger than gelatin and does not require refrigeration to set up, so not as much of it is needed to achieve the required effect. 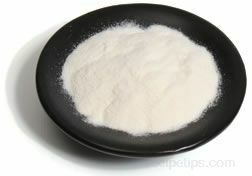 It is often used in commercially produced ice cream as a thickener. It is also known as agar-agar, kanten and Japanese gelatin.